4498 LOC RUSSIA (Zemstvo of Shatsk) (1889) Beehive*. Bees*. Fish*. Lovely letter franked with Chuchin 11-a which has been overprinted or canceled with Russian inscription something to do with fish or fishing "3 AV. POCHT. RYAVINSKII". 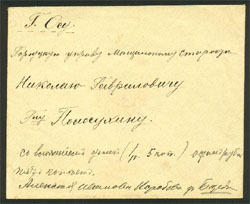 10448 LOC RUSSIA (Zemstvo of SHATSK) (1890) Beehive*. Bees*. Beautiful and sharp copy of the 3 kopecks, black on rose, Churchin No 16. 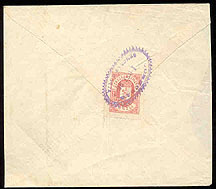 Oversize corner copy canceled by a circular date cancel on the back of cover. Attractive exhibit item! 2258 LOC RUSSIA (ZEMSTVO OF GADIACH) (1892a) St. George slaying dragon. 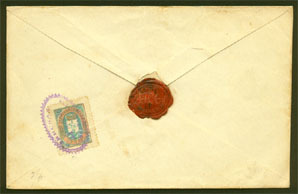 Registered envelope franked with pair of Chuchin No 25 tied by black circular date stamp. A rare usage! 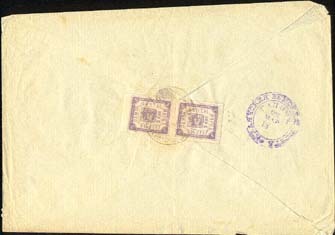 4499 LOC RUSSIA (Zemstvos of OSA) (1896) Beehive*. Bees*. 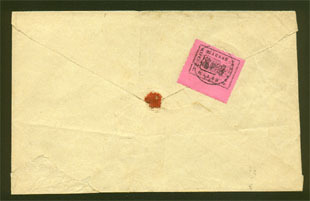 2 kopecks, pale lilac rose, Churchin No 16, canceled by clear violet toothed cancel dated October 1, 1896 on back of cover. Nice exhibit item! 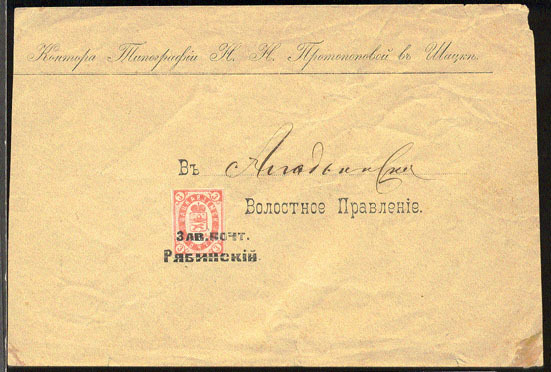 10450 LOC RUSSIA (Zemstvo of OSA) (1896) Beehive*. Bees*. 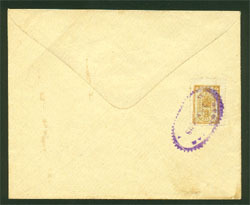 Beautiful 2 kopeck stamp, pale blue and lilac rose, Churchin No 14, canceled by violet toothed oval cancel on back of cover. Still with complete beeswax seal. Very rare and attractive exhibit item! 4501 LOC RUSSIA (ZEMSTVO OF SHATSK) (1898) Beehive*. Bees*. 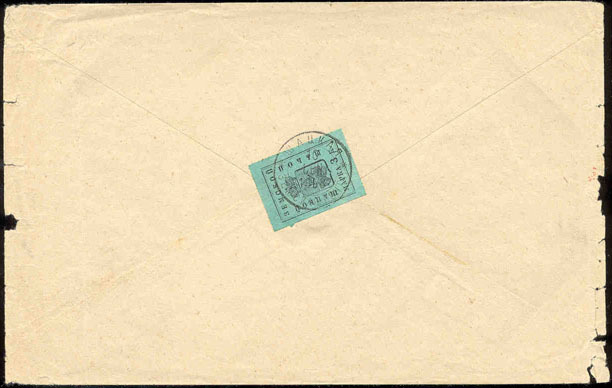 3 Kopecks, black on aqua green, Churchin No 19, rouletted, cancelled by circular date stamp on back of cover. Some rough cover edges as often, still extremely attractive. Rare exhibit item! 3051 LOC RUSSIE (Zemstvo de Shadrinsk) (1911) Ours*. Vison*. Enveloppe recommandé, au verso Shadrinsk 6 kop. brun en état parfait avec joli oblitération circulaire "Shadrinsk". Ces pièce sont très rare en cette condition. Belle pièce d'exhibition!